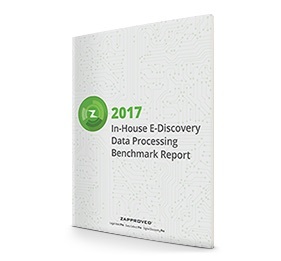 PORTLAND, OR--(Marketwired - January 25, 2017) - Zapproved, Inc., a pioneer in developing cloud‐based software for corporate legal departments, today published the 2017 In-House E-Discovery Data Processing Benchmark Report, which will also be discussed in depth during the Trends in Corporate E-Discovery webinar on Wednesday, Jan. 25, 2017. The results reveal the level of satisfaction and preferences of in-house e-discovery professionals, IT personnel, and legal operations staff regarding the speed, cost, ease-of-use, security and risk associated with their e-discovery data processing. These attributes were correlated with business criteria, such as case types, matter sizes, data sources and future trends, to produce insights. The study was a short "flash survey" of 17 questions, conducted online in November and December 2016. Participants include a diverse mix of 104 e-discovery professionals. 1. While today respondents indicated that the most common data collection sources are network storage, Outlook® and PCs, looking ahead they anticipate Microsoft® Office 365® and mobile devices (Android and iOS) being the dominant sources. 2. 2017 will mark a shift to spending significantly more on in-house storage and processing and much less on outside services. 3. When choosing to bring work in-house, cost predictability and information control are the top reasons. 4. Contracts, labor and employment, and internal investigations are most common types of matters handled internally, while cases such as class actions and specialized IP matters, are handled through outside vendors or law firms. "Corporate legal teams are clearly investing in processing and review technology to bring more matters in house. They are preparing for collection from cloud and mobile sources as more organizations must preserve data from these emerging technologies for the future," commented Brad Harris, Vice President of Product Strategy. Learn more at the webinar: E-Discovery Trends Benchmark Survey Insights Revealed on Wednesday, Jan. 25, 2017 at 10 a.m. PST. Founded in 2008 in Portland, Ore., Zapproved, Inc. is a pioneer in developing cloud‐based software for corporate legal departments. The Z‐Discovery Platform returns power to in‐house corporate legal teams and helps them navigate electronic discovery with minimal risk and cost, and it sets new standards for scalability and intuitive design. The company's flagship product, Legal Hold Pro, is widely adopted by Fortune 500 and Global 2000 corporations and has earned recognition as the Best E‐Discovery Legal Hold Product at the 2015 and 2016 Legaltech News Innovation Awards, Best of the National Law Journal 2014 - 2016. Zapproved was recognized in Deloitte's 2016 Technology Fast 500, the 2014 Inc. 500 as one of the fastest growing private companies in the U.S., and was named as a "vendor to watch" in the 2015 Gartner Magic Quadrant for E‐Discovery. Zapproved is EU-US Privacy Shield certified and is SOC2 ® Type 2 certified which validates that Zapproved's systems have controls in place to protect against unauthorized access (both physical and logical).